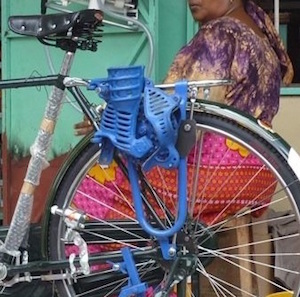 A corn shelling machine which can attach to most bicycles on the rear wheel. Shelling action is performed by pedaling the bicycle. The machine can shell up to 15 90kg sacks of corn a day. The machine can be attached and removed from the bicycle easily and does not impede its normal function when attached allowing for easy transport. The sheller is very durable and made entirely of steel and cast iron. The sheller is manufactured by Global Cycle Solutions inc. and is available for sale worldwide. Dimensions: 1' x 1' x 8"